It’s Thursday and according to the way that the world of Social Networking Legions engage their friends, fans and other populace – it that means we need to put up some kind of image that refers to our past or youthful times. A “throwback” to yesteryear so to speak. Ordinarily I have been fine with posting a scanned older photo on my personal Facebook page and perhaps a musically themed one on my Official PiercingMetal Facebook but since we are also celebrating the fact that KISS gets inducted into the Rock and Roll Hall of Fame later tonight I wanted to do something a little different and post it as a blog as well instead of limiting it to Facebook. So what do I mean? 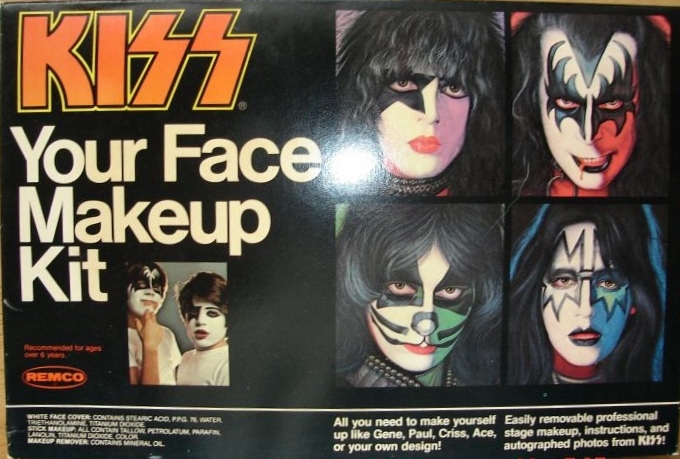 Well, the photo below is the box for the “KISS Your Face Makeup Kit” by Remco. It was released in 1978 and allowed you the means to do yourself up as any one of the masked foursome. Remember this was also at a time of complete band mystery and only a choice few knew what the band looked like without their signature makeup. I had two of these kits to the best of my recollection and back in early 1979 I tried my hand at them to magically transform myself into my favorite musical superheroes. 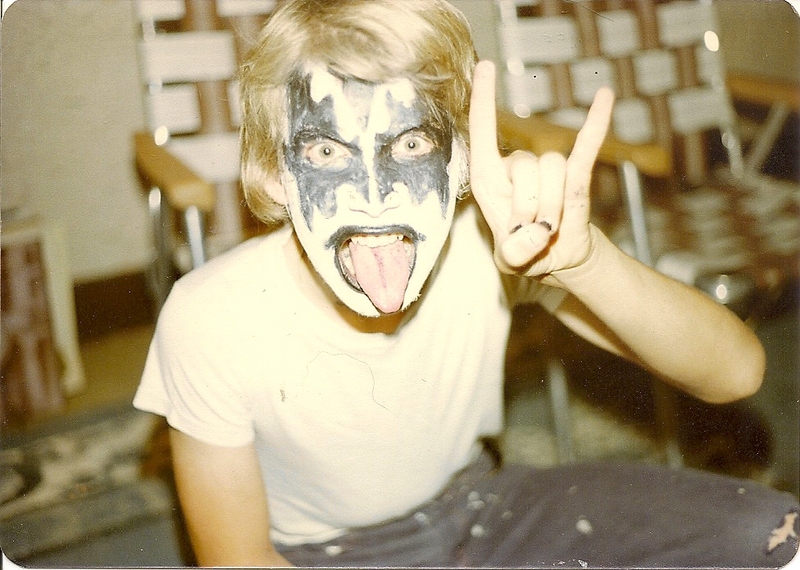 With Gene Simmons being my overall favorite, I decided to start with him and oh yes before you wonder if sharing these kind of images is a little embarrassing to me let me give you a resounding “No”. I am 100% comfortable with my fan geek ways. 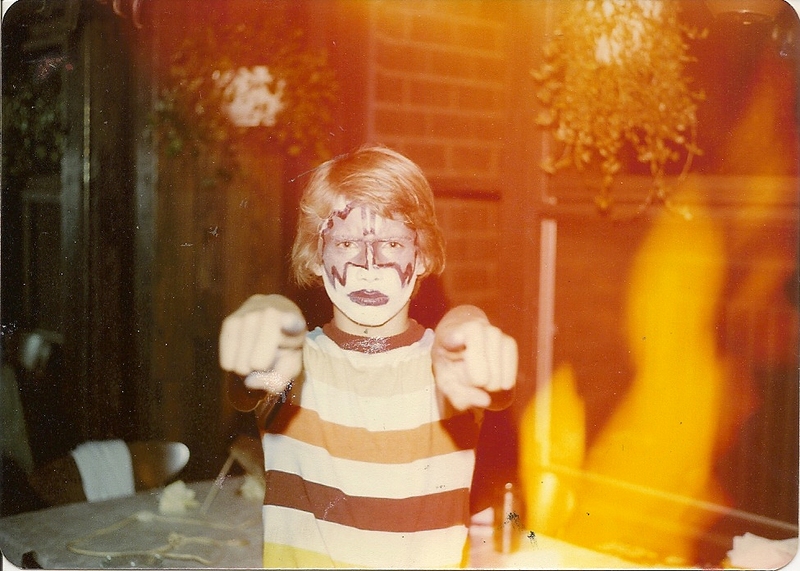 The next go at the makeup kit found me trying to do the Ace Frehley “Space Ace” face. I remember liking the challenge behind this one. It was a little trickier than the Gene one based on having to draw black around the silver. 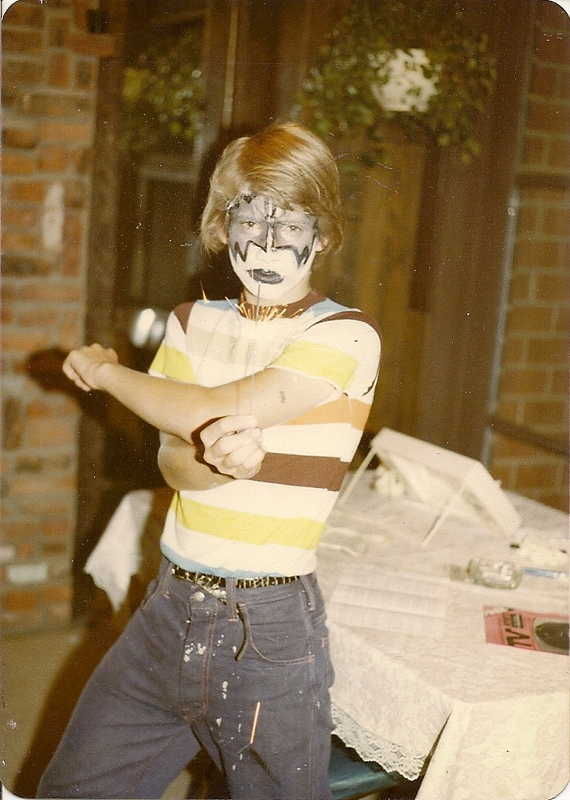 On the final time of playing with this kit I attempted the Peter Criss makeup and it was since it was the most involved of the whole foursome. There was black, silver, white, green, red. Sheesh. You almost needed a second kit just to do this one. 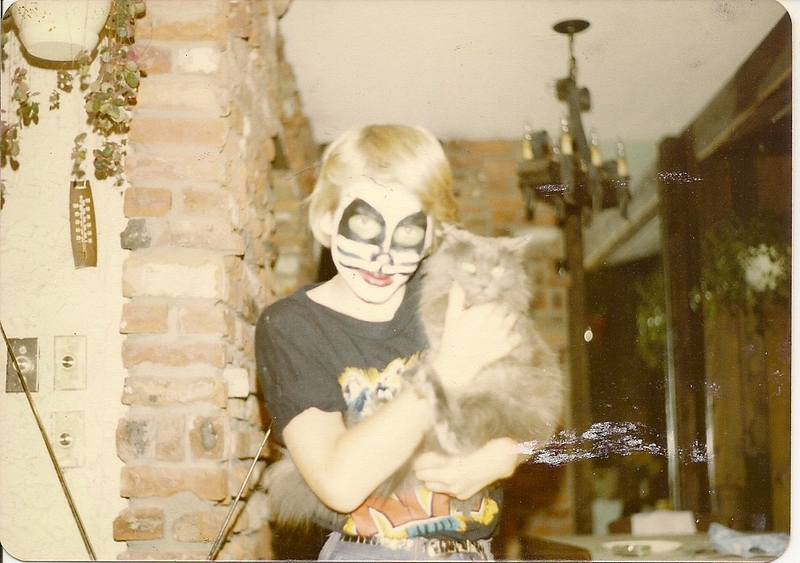 I liked finding this photo especially since it finds me holding Isis my cat. She was a rescue and one of the friendliest cats ever. She’s been gone quite a while now but lives on here with her weird master. I also seem to have a KISS tee on that has the comic book art in it. At least as far as I could discern. So there you have it, I hope you enjoyed this little bit of throwback weirdness. 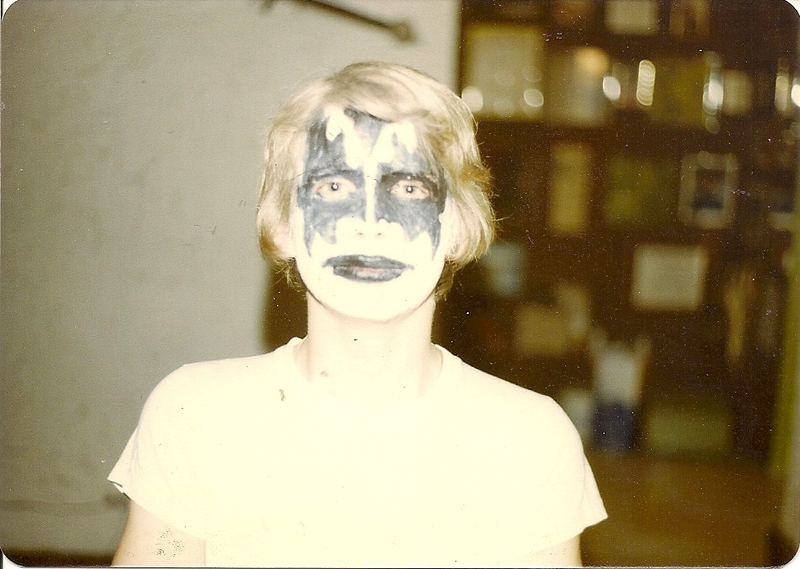 I can add that these forays and one final go round of securing Halloween candy with my friends would be the only times that I ever sported KISS face paint. I never even tried this when I started playing drums a few years later. 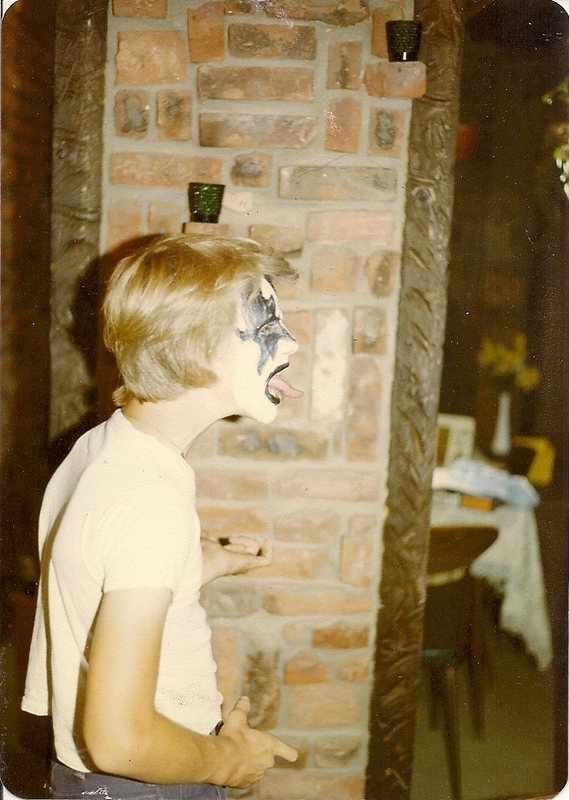 Now I realize that I didn’t do any representations of Paul Stanley’s “Starchild” makeup in the photos and I barely remember these even being taken but I had either depleted the amount of makeup in the two kits that I owned or I could not get the star to look quite right. Either case scenario is plausible to be quite honest. Congratulations to the original four founding members of KISS on their official induction to The Rock and Roll Hall of Fame. It’s been long overdue if you ask me. See you with our next adventure that will focus on whatever comes to mind.